Nancy Novosad has spent the last 27 years surrounded by students in Yukon classrooms, but she’s not a teacher. She alternates between helping the teacher and helping the students. Novosad wipes noses, applies bandages, plans arts and crafts activities, opens milk cartons, leads story time, and packs and unpacks backpacks. She also passes out papers, explains assignments, takes students to the restroom and reinforces lessons taught by Elizabeth Wilson, a pre-K teacher at Ranchwood Elementary School. Novosad is a teaching aide, which, combined with teaching assistants, is one of the fastest-growing segments of the public-school workforce. 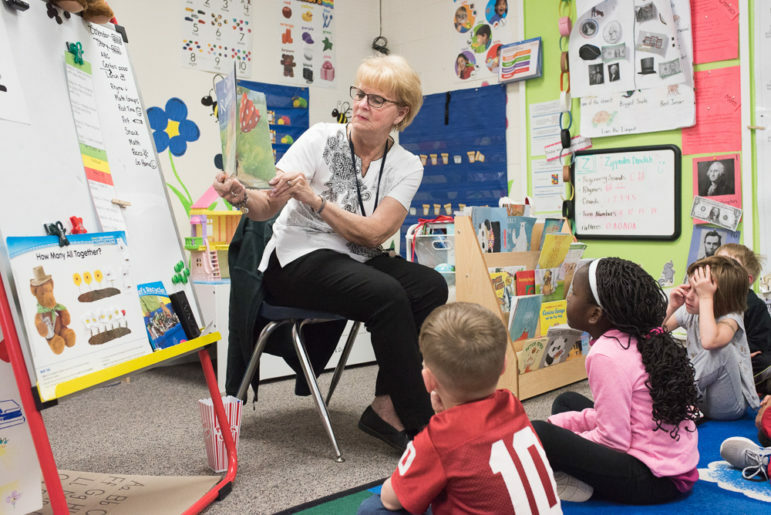 An Oklahoma Watch analysis of eight years of data and interviews with school district officials revealed that the statewide teacher shortage is forcing public schools to lean more on classroom helpers. Some of the state’s larger urban and suburban districts, in particular, are hiring aides and assistants, instead of hard-to-find and more expensive teachers. Aides and assistants’ jobs include many of the tasks teachers used to do but are less able to now because of increasing class sizes and more pre-K and special-education students, education officials say. When class sizes grow, “the best thing to do is have another teacher,” said Katharine Bishop, vice president of the Oklahoma Education Association, which represents teachers. But when lack of funding, student counts or other factors prevent the creation of two classes out of one, teacher support staff play a critical role, she said. Novosad, for instance, isn’t certified to teach, but her presence makes Wilson’s class of 21 four- and five-year-olds this year more manageable, Wilson said. Novosad allows the teacher to focus on instruction. “Without her, my room would simply be a day care,” Wilson said. Teaching aides and assistants have increased by 17 percent statewide from school years 2010-11 to 2017-18, based on the most recent count from the Oklahoma State Department of Education. In October, there were 10,334 teaching aides and assistants working in the state’s public schools, up from 8,854 in 2010-11. Enrollment growth has been slower, at 5 percent. The number of certified teachers is down 1 percent, even with an increase in emergency-certified teachers. District representatives say boosting classroom support staff, even those who are uncertified and inexperienced, is the next best thing to hiring teachers because it improves the ratio of adults to students. More support staff also are needed to help schools deal with an increase in students who have disabilities or are on individualized education programs. However, Jason Perez, chief human resources officer for the Mid-Del School district, said state and federal requirements force some districts to spend funds on support staff that could be used instead to hire teachers. Both positions pay much less than a teacher. Aides earn an average of $14,300 a year and assistants $15,100 a year, according to the latest state Education Department data. The figures do not include benefits and are based on a six-hour workday for employees who work at least 172 days a year, or about eight and a half months. Teachers earn about $38,354 on average without benefits, according to Oklahoma Policy Institute calculations. When classes grow bigger, especially in lower grades, the pressures mount for teachers to spend more time on babysitting and less on teaching. Wilson’s pre-K class of 21 is the largest she has had in more than a quarter-century, which reflects an increase in class sizes statewide. Under state law, districts must limit pre-K classes to 20 students and have an adult for every 10 students. But the limits were relaxed in 2016 amid budget shortfalls, so districts can’t be penalized if they exceed the limits. And in many cases, they have, if only slightly. Other limits on classroom sizes include 20 students per elementary-grade class and 140 students per day for secondary-school teachers. But those limits, which date to approval of House Bill 1017 in 1990, are no longer enforced. The blurring of limits potentially affects learning. In kindergarten, for instance, the need for classroom help can be acute. Children who don’t attend pre-K generally arrive at kindergarten less prepared for learning, putting additional pressure on teachers, studies show. Yet many school districts report using aides and assistants in pre-K but seldom in kindergarten. Even as class sizes grow, another factor that is driving the increase in pre-K aides and assistants is the rising number of districts moving from half-day to full-day pre-K, which doubles the need for teachers and support staff, according to officials in the Oklahoma City, Putnam City, Shawnee and Yukon districts. When morning and afternoon pre-K classes each become full-day, an additional teacher and assistant must be found. 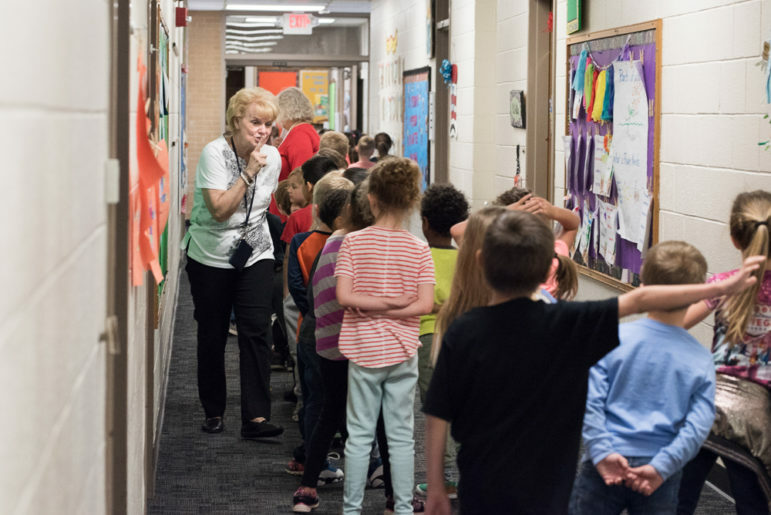 Nancy Novosad, a pre-K teacher’s aide at Ranchwood Elementary in Yukon, shushes students in the hallway on April 26. Another factor in the growth of teacher helpers is the rising numbers of special-education students – an increase of 15 percent statewide since the 2010-11 school year. Perez, of the Mid-Del district, said certified special-education teachers are difficult to find, forcing the district to rely even more on support staff. “They are the glue holding the schools together,” he said. Support requirements vary based on individual student needs, Perez said. In mainstream classrooms, aides or assistants are needed only occasionally to help students with disabilities. The need for support is greater in a separate special-education class. Five adults, including a teacher, may be needed in a class that has seven students with autism. Two adults may be assigned to a a single student with severe physical and learning disabilities. Tulsa Public Schools bucked the statewide trend of growth in teaching aides and assistants, with an 11 percent decrease since 2010-11. Kay Schmitz, the district’s budget director, said the declines came from a combination of budget cuts and changes to Title I, the federal program that provides extra funding for schools with high shares of low-income students. Federal funding requirements under the old No Child Left Behind Act and the updated Every Student Succeeds Act require classroom help to be “highly qualified” assistants in order for Title I funds to be used to pay them. Districts can pay aides using non-Title I funds. Schmitz said although Tulsa’s Title I funds don’t vary much from year to year, each school determines how that money is spent. The extra federal funds could be spent on teachers, assistants or classroom materials. Some of the district’s declines could be based on how schools used their Title I money, although they could also reflect vacancies in those positions at the time the annual personnel report was due to the state in the fall. While additional support staff can help students, it also can create more churn among the adults. In Deer Creek Schools, the number of support personnel has doubled since the 2010-11 school year. Ashley Dawson is grateful for this because her son, Lanham, has autism, obsessive compulsive disorder and epilepsy, and is in a special education class at Deer Creek Elementary. But Dawson said when new people arrive to help her son, it can cause setbacks for him. Lanham has an aide with him at all times during school. A group of aides rotate in and out of Lanham’s class, which has a certified teacher and three aides for eight special-needs students. Dawson said many of the new aides are young and inexperienced, increasing the chances of problems. This year, an aide who was new to Lanham’s class poured his soft drink into a cup instead of letting him pour the drink himself. It may seem like a small thing, but it’s an important ritual for Lanham’s daily routine, which his long-time aides understand, she said. The incident caused a meltdown that forced Dawson to take Lanham out of school for the rest of that day and the following day to give him time to calm down and refocus before returning to school. Turnover among aides and assistants for special-needs students can be high, which disrupts the consistency that helps keep these students on track.